Fall colors, Wrangell - St. Elias National Park. 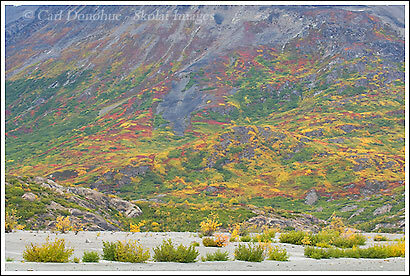 Fall colors, Wrangell – St. Elias National Park. Here’s another image from the recent trip to Ross Green Lake. This one from down on the riverbed, looking across the sand dunes toward the ridge to the north-east and the rich fall colors there. The myriad different tones and colors on display were enticing – unfortunately the brush is not quite as welcoming to walk through as it is inviting to do so. Fall is over way too quickly here in Alaska (like summer) and I’m keen to get back to the park and capture some more photos of the great fall colors this year. This entry was posted in Adventures, Alaska, Backpacking and Hiking, Fall, Landscapes, Travel, Wrangell - St. Elias National Park on September 17, 2008 by Carl D.
That’s the AK I know ;). On the bus ride to Wonder Lake I had my mouth dropped open in amazement at the various colors painting the frozen tundra. I did manage to take a hand held shot of the landscape in the bumpy bus and thank goodness it came out sharp with all the elements in focus! One of my prized shots. It looks like fall might be just a tad early here in the lower 48, well at least in NC, don’t know for sure. We will know by the end of next month :). That’s an amazing bus ride in the fall, isn’t it. Denali is awesome, for sure. How are the colors shaping up down your way now?